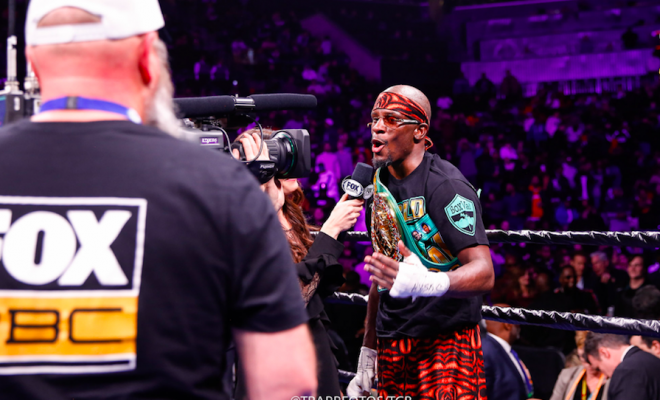 In one of the more absolutely puzzling decisions of the year in boxing, Detroit native Tony Harrison scored a stunning upset of Jermell Charlo Saturday in Brooklyn, lifting the WBC junior middleweight title. The judges at ringside had the fight unanimously for Harrison on scores of 115-113, 115-113, and 116-112. BLH had it 117-111 for Charlo, as did FOX’s Larry Hazzard. Charlo (31-1, 15 KO) loses not just his title belt but also a potential big unification with Jarrett Hurd, another PBC titleholder at 154 pounds. He really appeared to outwork Harrison (28-2, 21 KO) over the course of the fight, but Harrison did hang in there, going the full 12 for the first time in his pro career. Judges clearly saw Harrison doing more than “hanging in there,” as well as seeing Charlo doing less than most of the rest of us thought. There’s no question Harrison had moments throughout the fight, but it certainly didn’t seem like it was enough to actually win. “I grinded, I grinded, I grinded, and I showed championship composure,” Harrison said, crediting his jab and ring generalship. He then offered Charlo a rematch, but Charlo came over to the mic and said that Harrison had already told him he knew he didn’t win the fight, which of course Harrison denied. You’d think we’re headed for a rematch here, but who knows?